Red carnations and mini carnations along with red roses and white spider mums are adorned with shiny ornaments. 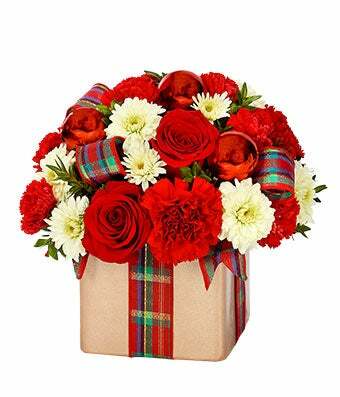 Delivered in a gift shaped vase, the bouquet is decorated with a festive ribbon. The Holiday Flower Present is a truly charming gift for the holidays.